Beatrix Potter was an English author, illustrator, natural scientist, and conservationist. She wrote and illustrated more than 20 children’s books featuring the animals Peter Rabbit, Jemima Puddle-Duck, and Benjamin Bunny. Potter was born in 1866 in London. Her father Rupert had trained as a lawyer but devoted himself to art and photography, her mother Helen was also artistic and skilled at embroidery and watercolours. She was educated by three governesses, and grew up isolated from other children. She loved animals and had numerous pets which she would study and draw including mice, rabbits, a hedgehog and some bats, along with collections of butterflies and other insects. Potter spent her summer holidays in, Dalguise an estate on the River Tay in Perthshire, Scotland. On her visits to Scotland, she developed a love of landscapes, flora and fauna and spent a lot of her time painting. In 1878, Potter enrolled at the new National Art Training School in South Kensington where she was awarded an Art Student’s Certificate for model drawing and freehand. By this time, Dalguise was no longer available and she spent her summer at Wray Castle in the Lake District. While in the Lake District, Potter met the vicar of Wray, Hardwicke Rawnsley who would later become the founding secretary of the National Trust. Rawnsley’s passion for the countryside and country life inspired a similar interest in Potter, and Rawnsley had a lasting impact on her life. At 14, Potter began keeping a diary written in a code she devised herself. The diary was both an artistic and literary endeavour and Potter would comment on society, write about art and artists and detail stories and events in her life. She kept the journal from 1881 to 1897. In the Victorian era, it was rare that a woman would progress to higher education and Potter was able to continue her education herself, pursing an interest in natural science. Potter focused her studies on mycology, the branch of biology concerned with the study of fungi. She was drawn to fungi because of their colours and the joy she felt in painting them. In 1892, Potter met the famous naturalist Charles McIntosh during a summer holiday in Dunkeld in Perthshire. McIntosh helped her with the accuracy of her illustrations, taught her taxonomy and provided her with live specimens to paint during the winter. Potter developed an interest in how fungi reproduced, which lead to her creating microscopic drawings of fungus spores and subsequently developing a theory of their germination. She consulted with botanists at Kew Gardens and managed to convince the mycologist George Massee of her theory of hybridisation and ability to germinate sports. Potter’s theory was rejected by the Director at Kew, William Thiselton-Dyer because of her gender. She submitted a paper, On the Germination of the Spores of the Agaricineae, to the Linnean Society in 1897. The paper had to be introduced by Massee as women were unable to attend meetings or read papers at the time. She later withdrew the paper, but continued to studying create illustrations and drawings of fungi. She later gave these drawings to the Armitt Museum and Library, where they are still used to identify fungi. As well as her interest in fungi, Potter had continued to illustrate animals and used her talents to earn money in the 1890s. She created and sold greetings cards featuring animals, mostly mice and rabbits. In 1890, several of her drawings of her rabbit Benjamin Bunny were bought used to illustrate verses by Frederic Weatherly in a book entitled A Happy Pair. In 1893, more of her drawings were used in Weatherly’s Our Dear Relations. A year later, she sold a series of frog illustrations and verses for Changing Pictures, an annual published by Ernest Nister. Potters success made her determined to create her own illustrated stories. Peter Rabbit had first appeared in 1893, when Potter sent an illustrated letter to the son of Annie Carter Moore, her former governess. The letter would later become one of the most famous children’s letters ever written. In 1990, she turned her letter into a storybook about four little rabbits whose names were Flopsy, Mopsy, Cottontail and Peter. Initially, she published it herself in black and white as she could not find a buyer for her story. Her old friend Hardwicke Rawnsley had faith in her work, and took it around the London publishing houses. Eventually, Frederick Warne & Co accepted it on the recommendation of their children’s book artist L. Leslie Brooke. Potter agreed to colour her illustrations and in 1902 The Tale of Peter Rabbit was published and was a great success. Potter then created two or three little books a year, including The Tale of Squirrel Nutkin and The Tailor of Gloucester, both of which had begun life as illustrated letters. She created 23 books, the earliest with Norman Warne as her editor. In addition to the books, Potter created and patented a Peter Rabbit doll which was followed by other merchandise like painting books and figurines. In 1905, Potter and Warne became engaged, despite the objections of her parents because he was “in trade” and beneath her socially. A month later, Warne tragically died of leukaemia. Potter bought Hill Top Farm in the Lake District that same year. The books, The Tale of Ginger and Pickles and The Tale of Mrs. Tittlemouse show how much she enjoyed country living. In 1913, Potter married local lawyer William Heelis who had assisted her with buying land around Hill Top Farm including the nearby Castle Farm. Potter and Heelis set up home at Castle Cottage, and Potter produced a few more books before turning her attention to her farms and the preservation of land in the Lake District. She bred and raised a prize-winning flock of thousands of Herdwick sheep, which filled the land of Troutbeck Park Farm. In 1942 she was named President-elect of The Herdwick Sheepbreeders’ Association, the first time a woman had ever been elected to that office. Sadly, she died before taking office. Potter died in 1943, leaving most of her land to the National Trust to preserve it for future generations to enjoy as she had. Hill Top Farm is now open to the public. Potter’s books and illustrations continue to inspire and delight children and are hugely successful. Almost all of her original illustrations were donated to the National Trust, and collections of her work are on display at the Victoria and Albert Museum in London, the Free Library of Philadelphia and the Lloyd Cotsen Children’s Library at Princeton University. A collection of Potter’s fungus paintings now hang at Perth Museum and Art Gallery and many of her beautiful and accurate drawings of fungus were included in the mycologist W.P.K. Findlay’s Wayside & Woodland Fungi, which fulfilled Potter’s wish to have her fungus drawings published in a book. In 1997, The Linnean Society issued her a posthumous apology for their sexist response to her research, and now recognises that she was the first person to present the idea that lichens are symbiotic life forms in a scientific paper. 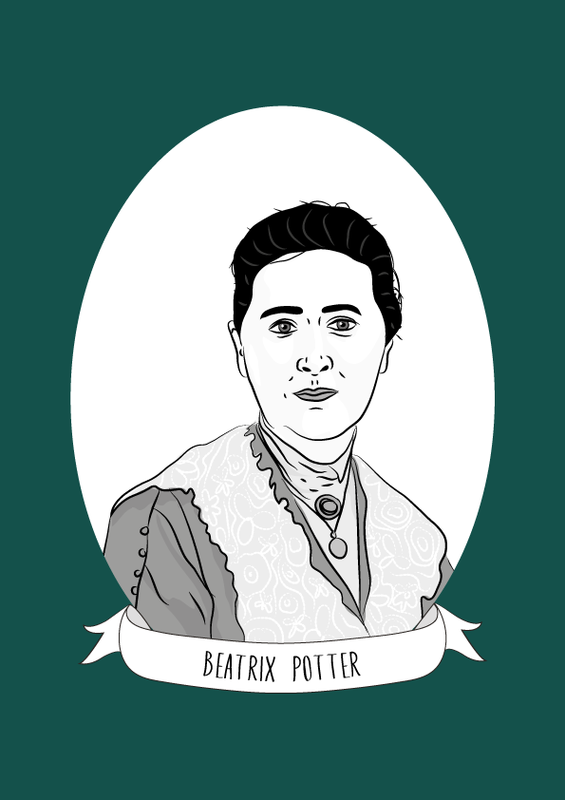 Potter was a pioneer in science, and her work should be celebrated to help encourage women to pursue science as a career.